: This may be one of DC’s most luxurious restaurants, but every penny you spend buys you some of the city’s most luxurious food. First, it’s a Michael Mina effort, which ensures top quality. 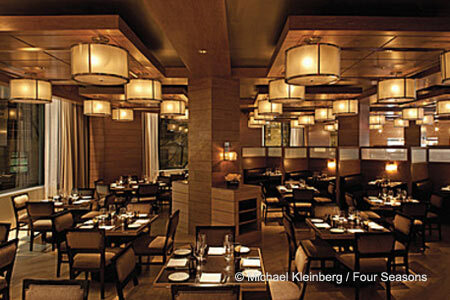 Next, it’s housed in the fancy Four Seasons Hotel in Georgetown, a destination known to attract celebs and politicos. Finally, its lush décor smacks of refinement. And, the menu keeps pace with the visuals: wood-grilled beef cuts, the signature lobster potpie, and oxtail braised in red wine. If you like to splurge, you'll find that the grilled foie gras and the freshly baked rolls drizzled with truffle butter are about as decadent as you can get. But for those with simpler tastes, the lunchtime ten-ounce steak burger with its side of hot fries crisped in duck fat rates as the city’s ultimate hamburger---tall and stately in its bun, and with pickle slices and Cabot Clothbound cheddar as accents. Other aspects to know about this restaurant: the kitchen has gone green and raises and uses herbs and other small greens from the hotel’s adjacent pocket garden along the C&O Canal. And for the diehard foodie, know that when the menu says “wood-grilled” the chef actually stokes a wood-burning grill, and if you are seated in the dining area facing the kitchen, you can see the guys at work over the cook fires. A handsome bar, a mixologist with clever ideas, and a luxe wine list add to a guest's delight.